Our Youngest Fundraisers Are At It Again! 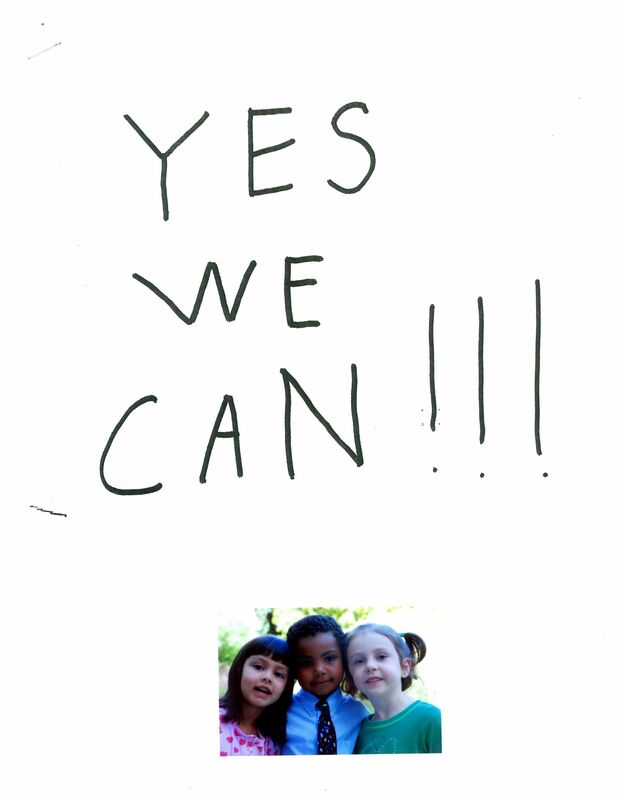 Every year, the graduating pre-school students at With Care Child Care have to complete a public service project. 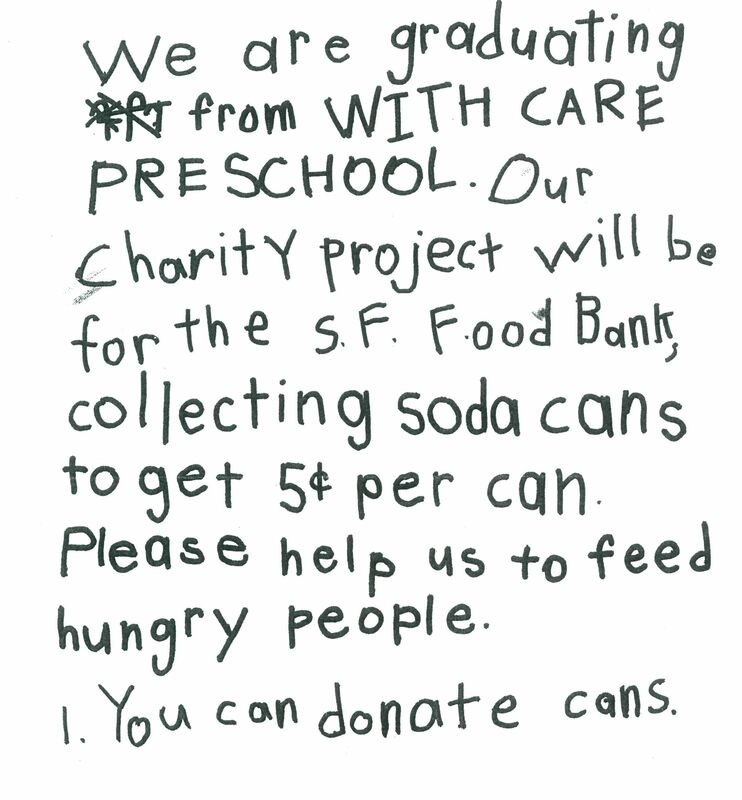 Last year, 5-year old Phoebe decided to recycle soda cans and donate the money to the San Francisco Food Bank. Not only did she beat her goal of raising $1,000 – the story of her “really, really big” goal spread over the internet, and Phoebe ended up raising $20,000! 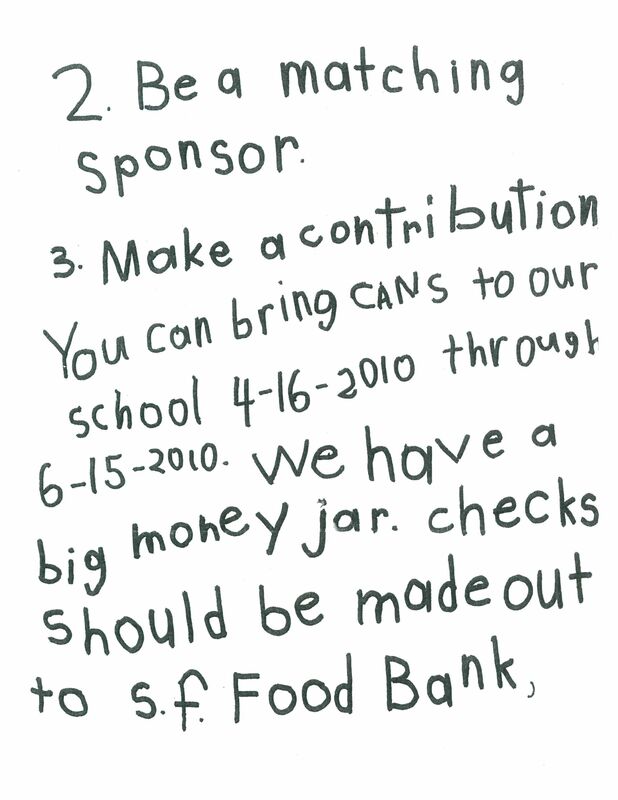 If you’d like to help Emily, Ethan and Sophia fill their “big money jar” or add to the stash of cans they’re recycling for 5 cents apiece, please contact their teacher, Kathleen, at 415-550-7527. Or, you can make a donation on our website, using this special link. 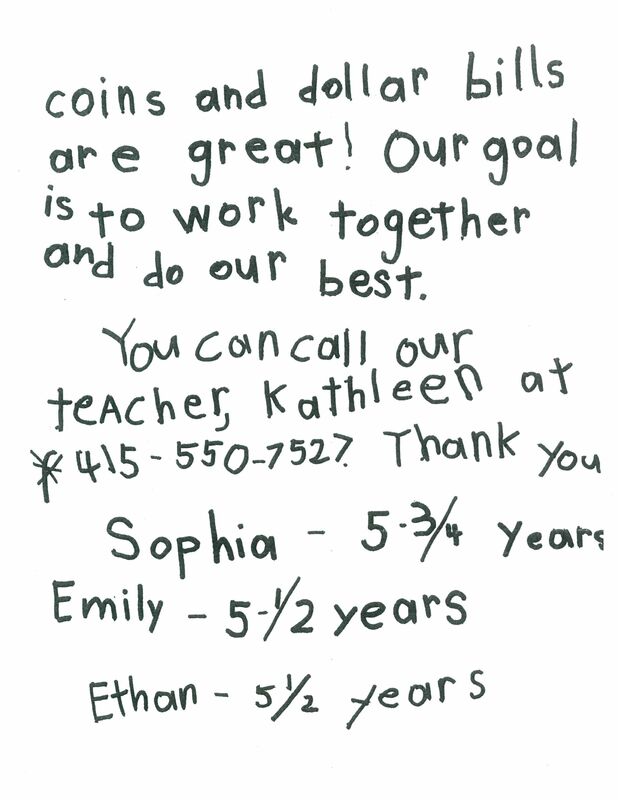 We’ll be sure that Emily, Ethan and Sophia get credit for your generous support of their cause! 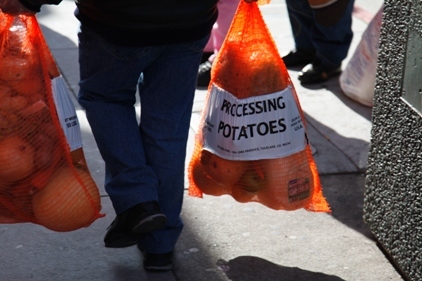 At grocery pantries, we don’t just hand out food – we also hand out advice and information. We give clients recipes and fact sheets to get them acquainted with our many fresh produce items, so they know how to use them in their meals. That’s especially important when clients aren’t culturally familiar with a particular vegetable or fruit. Recently, we’ve gone even further, partnering with fellow non-profit, Leah’s Pantry, to test a broader nutrition education program at some of our 200+ grocery pantries. The seminars are 1.5-hour sessions over the course of six weeks. They educate our clients about the food distributed throughout the pantry network, and help them create smart goals based on nutritious and healthy lifestyles. At one pantry, we introduced many people to the nutritious and easy-to-prepare grain, quinoa. 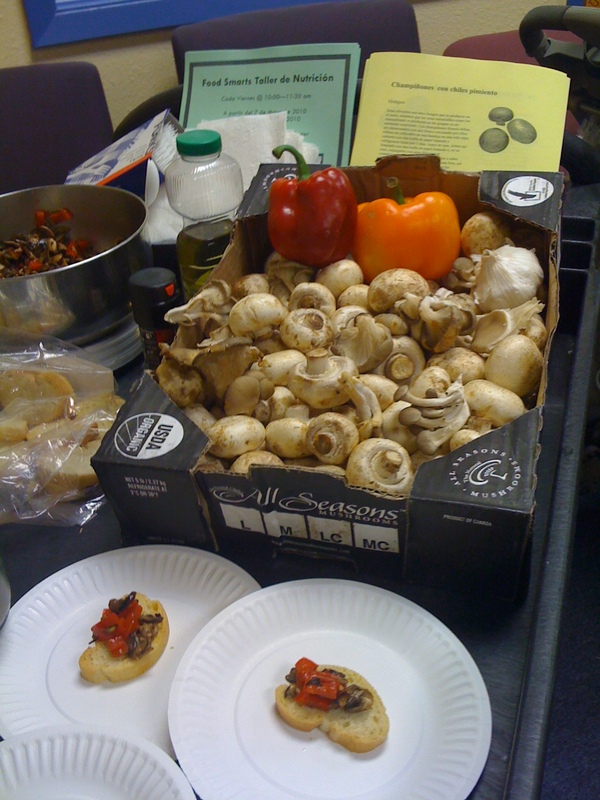 At others, we recently demonstrated and sampled a healthy, delicious recipe using mushrooms and bell peppers – fresh items which were available free to clients. Here’s the recipe, in case you’d like to cook up something healthy yourself! Wipe dirt off mushrooms with a wet towel. Trim stems of mushrooms and slice thinly. Rinse red pepper and remove stem. Cut peppers in half lengthwise, remove seeds and de-vein. Slice into thin strips. Pour 2-3 tablespoons of extra virgin olive oil into a large, heavy-bottomed frying pan. Heat on medium. When oil is hot, add mushrooms, peppers and garlic slices. Saute until vegetables are soft, being careful not to burn the garlic or over-cook the vegetables. Serve warm on toast or as a side dish. Fresh mushrooms should be stored with cool air circulating around them. They should be placed on a tray in a single layer, covered with a damp paper towel and refrigerated for up to 3 days. Before use, they should be wiped with a damp paper towel or, if necessary, rinsed with cold water and dried thoroughly. Mushroom often taste like meat when cooked and seasoned well, so they are a great meat-substitute for vegetarians. Half of the food the San Francisco Food bank distributes is fresh produce! Please use the comment field below to share your thoughts – and your own recipes.